MCLEAN, Va., Jan. 11, 2019 /PRNewswire/ -- Iridium Communications Inc. (NASDAQ: IRDM) announced today that at 07:31 am PST (15:31 UTC) a flight-proven SpaceX Falcon 9 rocket launched from Vandenberg Air Force Base and delivered the final 10 Iridium® NEXT satellites to low earth orbit (LEO). All 10 satellites have successfully communicated with the Iridium Satellite Network Operations Center and are preparing to undergo initial on-orbit testing. 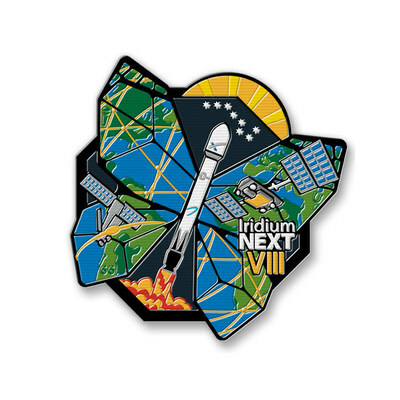 This was the eighth and final launch for Iridium's historic launch campaign with SpaceX, seeing a total of 75 new satellites deployed over less than two years. "It has been an honor to deliver 75 new Iridium NEXT satellites to orbit. Matt and the entire Iridium NEXT team have been incredible to work with," said Gwynne Shotwell, President and Chief Operating Officer at SpaceX. "On behalf of all of our employees, congratulations to Iridium on achieving this incredible milestone." The Iridium satellite constellation is unlike any other in orbit and is the only communications network with pole-to-pole coverage of the entire planet. It is comprised of six polar orbiting planes, each containing 11 crosslinked satellites totaling 66 in the operational constellation, creating a web of coverage around the Earth. The 10 Iridium NEXT satellites launched as part of this final mission were deployed to orbital plane three. Since the launches began, the constellation has been undergoing a one-for-one replacement, new satellite for old, achieved through a highly choreographed in-space maneuver known as a "slot swap." "There are few words to describe what it feels like to complete a vision started many years ago when I joined the company and what it means for Iridium and our future," said Iridium CEO Matt Desch. "Our gratitude to SpaceX for helping bring this new generation of satellites to orbit, so flawlessly every time is beyond words. However, for Iridium, we're not quite across the finish line yet, as there is still some work to do to put these satellites into operation. Once that's complete, our future will be in place. I'm just incredibly proud of our team right now." To date, new satellites make up 60 of the 66 satellites in operation, with the final six scheduled for activation in the coming weeks from today's launch. Iridium NEXT satellites were designed by Thales Alenia Space, which serves as system prime contractor, and are being integrated by Thales' subcontractor, Northrop Grumman. The production process features an 18-station, state-of-the-art assembly line system for all 81 Iridium NEXT satellites being built. "Totally deployed, Iridium NEXT is now arguably the world's highest performance and most sophisticated constellation which represents today's state of the art in terms of technology and flexibility and Thales Alenia Space is so proud for having risen to this huge challenge. I would like to thank Iridium for having placed its trust in us, and thank everybody at my company, at Iridium and at our partners for having worked as "One Team," all with the sole objective of delivering the constellation to orbit as quickly as possible, while guaranteeing top-flight quality," declared Jean Loïc Galle, CEO of Thales Alenia Space. Statements in this press release that are not purely historical facts may constitute forward-looking statements as defined in the Private Securities Litigation Reform Act of 1995. The Company has based these statements on its current expectations and the information currently available to us. Forward-looking statements in this press release include statements regarding the deployment of the Iridium NEXT constellation, and the capabilities and benefits of new services to be enabled by the Iridium NEXT constellation, including Iridium Certus and Aireon. Forward-looking statements can be identified by the words "anticipates," "may," "can," "believes," "expects," "projects," "intends," "likely," "will," "to be" and other expressions that are predictions or indicate future events, trends or prospects. These forward-looking statements involve known and unknown risks, uncertainties and other factors that may cause the actual results, performance or achievements of Iridium to differ materially from any future results, performance or achievements expressed or implied by such forward-looking statements. These risks and uncertainties include, but are not limited to, uncertainties regarding potential delays in the Iridium NEXT deployment, the development and functionality of Iridium NEXT and related services, and the company's ability to maintain the health, capacity and content of its satellite constellation, as well as general industry and economic conditions, and competitive, legal, governmental and technological factors. Other factors that could cause actual results to differ materially from those indicated by the forward-looking statements include those factors listed under the caption "Risk Factors" in the Company's Form 10-K for the year ended December 31, 2017, filed with the Securities and Exchange Commission (the "SEC") on February 22, 2018, and in the Company's Form 10-Q for the quarter ended September 30, 2018, filed with the SEC on October 25, 2018, as well as other filings Iridium makes with the SEC from time to time. There is no assurance that Iridium's expectations will be realized. If one or more of these risks or uncertainties materialize, or if Iridium's underlying assumptions prove incorrect, actual results may vary materially from those expected, estimated or projected. Iridium's forward-looking statements speak only as of the date of this press release, and Iridium undertakes no obligation to update forward-looking statements.